Tommy Lee Will Sell Your House originally uploaded by Glark. A recent article - How to sell your home - from the UK's Sunday Mirror by Barry Cashin inspired a Carpetology blogpost similarly titled: How To Sell Your Home. As I read the article, I couldn't help but be struck by the similarities between selling one's home and one's retail experience. In either case, you want to make a good impression on the prospective buyer. Here's the advice from Carpetology's How To Sell Your Home, modified for relevance to the retail buying experience. 1. Clean, declutter and neutralize the store. "It... comes down to presentation and whether the buyer can visualize themselves living" with the products you sell. In neutralizing, though, don't create an antiseptic environment. Make sure to showcase ideas, offer possibilities and demonstrate style and fashion. 2. Work on the curb appeal: repaint, fix outside details, add flowers or other shrubs. "Purchasers form strong and immediate impressions about how a [store] looks from the outside, so make sure yours halts them in their tracks." 3. Make the inside warm and welcoming. Make sure that anyone entering your store understands immediately what each area of your store is about. 4. If any hallways seem too dark, add a "strategically placed" mirror. "Carefully positioned, it will add space and maximise the light." Although the article suggests that citrus smells are better than baked goods' smells, if you are offering hospitality within the store, I strongly suggest fresh edibles. Don't forget fresh flowers. 5. Replace old, worn, dirty carpet. "It will lift the appearance" of the store. Add new curtains, clean the carpet and generally brighten up spaces with throws and pillows. Be sure to de-personalize the spaces, but make them welcoming. Don't forget - assuming you are a flooring store - that your floor represents selling space. Use it to showcase magnificent product concepts! 6. In the kitchen and bathrooms, make sure to clean, update, showcase ideas, and generally make these spaces drop-dead gorgeous! If you don't believe how important these spaces are, then check out the Bathroom Blogfest entries. 7. Reposition furniture to optimize for space. Make sure that you have tables and chairs in your store. Don't forget the flowers. Winter, January 2008 originally uploaded by Sebastian..C.
It's still January and I located a few more Retail Tips to add to January Retail Tips. 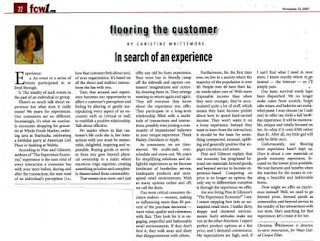 First, from Annette Callari in the January 2008 issue of National Floor Trends comes Want to be great in 2008? Here are a few things to get you started. BECOME A CHAMELEON… in other words, do something that your customer base wouldn't expect of you. Something out-of-the ordinary and buzz-worthy. RESURRECT THE PRIVATE SALE EVENT… with special invitations for a specific and limited time frame. Also, buzz-worthy, but in a different way. EXPAND YOUR OPERATION… can you quietly acquire a competitor's organization? Even if that competitor operates in a different spectrum from yours? SHARE YOUR SPACE… can you invite a business that enhances yours, with a complementary service perhaps, to lease space from you? Not only do you lower your overhead, but you also benefit from new traffic and new potential customers. JOIN WITH LOCAL BUSINESS LEADERS… How involved are you with your local community? Do other business owners know about you? IN-STORE COLOR AND DESIGN CLASSES… Be known for offering design knowledge to existing and potential customers. Not only are you connecting with people before they've actually entered into the purchase process, but you're also allowing them to get to know you, your salespeople and your store. In other words, you've started to develop a relationship with them. Then, Sam Allman in the November 2007 issue of the same magazine Habit: Get Noticed mentions Michigan Tile & Carpet Co., a company whose bathrooms I featured during the Bathroom Blogfest. Here's brilliant additional perspective on their operation and how they attract new potential customers while serving their community! The owners included an unusual structure to their new 10,000 sq. ft. showroom: a studio and conference room to "host events that are likely to attract people looking for the kind of flooring, design, installation, and maintenance services this company so ably provides. The 1300 sq. ft. annex has two parts. In the Studio and Design Gallery, visitors can view the latest flooring materials displayed in a strikingly dramatic setting. The studio offers designers an inspiring background for their consultations with clients. The conference room, with its comfortable seating, audio-visual technology, restrooms and kitchen, can host design seminars and other meetings. The Starks invite area architects, interior designers, building contractors, realtors, and other community organizations to use this space for presentations and meetings (hence the community service aspect). It can be used during regular store hours, as well as evenings and weekends. It has a separate entry and parking area." Isn't that not only clever, but also extremely strategic? It certainly sends a strong message to the community that this is an organization to take seriously for both products and services. "You’ve got to be willing to go the extra mile and do those things that your competition isn’t willing to do." You might even consider literally owning red carpet and rolling it out for specific occasions such as the ones Annette mentions above. The article mentions The Celebrity Experience: Insider Secrets to Delivering Red Carpet Customer Service , a book with lots more advice on "how to turn customers into lifelong, adoring clients by delivering consistent red-carpet customer service. " 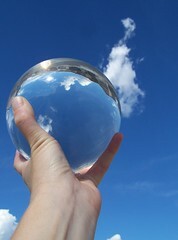 Maya Avrasin from FCW featured "Healthy business checklist: Are you in control?" on 11/05/2007. In it she referred to a handy booklet from The Retail Owners' Institute, which is full of valuable information. I looked high and wide throughout the site for a link to the booklet -- without success. I did, though, find a reference to the chart titled "The Three Stages of Retailers in Decline" - representing the 8 vital business signs - in this 12/01/1998 articled from Furniture World Magazine titled Preparing For A Recession. January is almost behind us. I hope these tips help make the most, not only of the month, but also of the year ahead. I have big news to share with you: we have a new blog. It's called The Carpetology Blog. It's our official Wear-Dated blog, giving us a chance to tell the story of carpet. Carpet that we can romance, share relevant news of, and definitely be practical about. It allows us to raise carpet's profile in the public arena. After all, carpet is classy; it's luxurious. It's an essential part of one's individual statement of style and identity. It's comforting, it's sensuous. And, it's also fun. 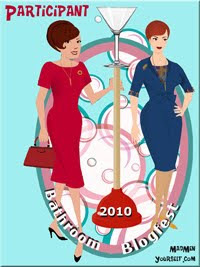 Marianne Cone - Bathroom Brand Manifestations: M&Ms, Think WOMAN - Word of Mouth Advertising Network, Lafayette Gourmet - A Feast For The Senses and Fun At The Doctor's!? You haven't yet met Ramona Swain. She's our web mistress and a marketing manager on the Ultron contract carpet fiber side of the business. Her Wear-Dated experience goes back to my Wear-Dated Upholstery days. I anticipate that others from our carpet fiber business will be involved. Who's to say that others from the industry won't get involved, too? To date, our posts cover the basics: The Wear-Dated Carpetology Blog and who we are - Meet Elizabeth Hise: "Aren't I Lucky...? ", Meet C.B. Whittemore. There's practical advice like Keeping Carpet Clean, How To Sell Your Home and Dog Day Afternoon. And stories about carpet in the news - Create Your Own Red Carpet Experience!, Red Carpet Treatment and Presidential Design and Carpet. I will periodically update you here on the latest postings. I'd love to hear what you think. 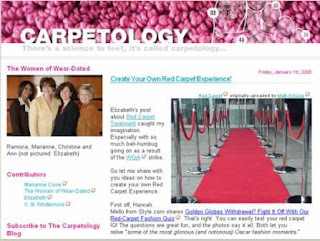 Let me know if you come across any fun stories or ideas that relate to carpet, and please consider subscribing to The Carpetology blog! NOTE: A special thank you to Diva Marketing's Toby Bloomberg and Anna Farmery from The Engaging Blog for being the first commenters on The Carpetology Blog. For that, I make you honorary Women of Wear-Dated! That said, Ann recently shared with us some of her Trend Insights. 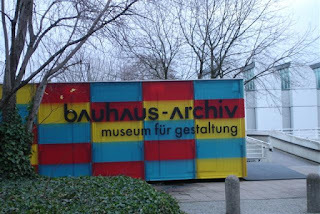 These come from her observations of the marketplace, visits to European trades shows [e.g., Heimtextil, Maison & Objet, Neocon...], her work with the Color Marketing Group and many other sources of inspiration. Since I find trends really interesting, I thought I would share them here. Historic color is seen in new combinations, finishes and applications. Texture adds interest and pearlized surfaces add an edge. Natural products like wood and bamboo serve as key materials when paired with the new synthetics. Together, these colors and finishes give a new edgy appeal. Rural living re-explores the idea of traditional craftsmanship. By its very nature, it offers “eco” credentials and meshes with this consumer's desire for simplicity and authenticity. Super Nature is a futuristic take on rural living. Products can emulate nature but don’t have to be natural—just in keeping with ecological criteria. Then, there's a sense of Discovery relating to…. International scopes! Attendance figures for galleries, museums and cultural events continue to increase. This creates a more informed consumer who is looking for and recognizes both style and quality. Instant communication, increased cultural and artistic awareness combined with a more traveled consumer has created a demand for “good design” at home. The new and foreign were once seen as “exotic” but have lost some of their intrigue. Thus, we see a trend of new appreciation for objects lost through time. Rediscovery of the decorative arts and beauty found in imperfection is seen in polished concrete and exposed brickwork. Everybody wants to show creative intelligence through the way each chooses to live. 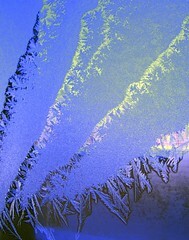 And, increasingly, people are comfortable exploring and expressing that creativity. What's the 2008 Version of Age of Conversation? What might the future hold? originally uploaded by strange.little.mama. Drew's post says it all: Calling all authors -- time to exceed Age of Conversation! Hard to believe that we are nearing a full year since we originally released it. And, if you missed IT, then consider absorbing it all via The Age Of Conversation RoundUp including The Age of Conversation dedicated website and the creation story. So, Drew and Gavin are at it again and intend to make the next book bigger and better than The Age of Conversation. You have to admire these two! Here's how: e-mail Drew and tell him that you're in. + Why Don't People Get It? You may vote for your top choice via SurveyMonkey - Click Here to take survey. Anyone can vote, so let yourself go wild! Just don't wait too long. The survey closes on January 31, 2008. From personal experience, if this next version of Age of Conversation is anything close to the original one, then I will be ecstatic. I will truly never forget how momentous an undertaking it was in so many ways. Don't wait! Vote now, and consider becoming an author. Luxury Marketing: It Surrounds Us! Touch of Luxury originally uploaded by spaghetti.princess. So many luxury marketing opportunities around us. How delicious! With the consumer in control, it behooves us to take luxury seriously. A consumer who has so many options before her requires an unforgettable experience every time she interacts with us. Last May, I attended a session sponsored by the The Luxury Marketing Council, New York Chapter on customer service. The speakers, Evan R. Hirsh and Robert S. Reppa, from Booz Allen Hamilton shared recently conducted research on The Luxury Touch, published in strategy+business magazine, in which they "reveal four principles of customer service that help luxury brands like Ritz-Carlton, Nordstrom, and Lexus stand apart." According to their article: "Superb service is the indispensable ingredient of successful high-end brands" which deliver such outstanding levels of service day-in/out because of their organizations' commitment to customers. Customers occupy the center of all decisions. They are the reason for being. MarketingProfs in their 1/14/2008 issue of Get To The Point on Customer Service the Lexus Way refers to Mavericks At Work with additional details and links on what makes Lexus so unusual in its luxury touch. I hope you note what to me is the biggest reason for superb service: increased loyalty. That's right. Andrea Learned in Men and Women Are Like-Minded Luxury Shoppers reminds us that "we live in a world of abundance, and EVERYONE now expects/demands much more relevance and higher standards of service from brands. And, brands have to listen, because they are now scrambling to keep, let alone grow, their markets." An opportunity certainly comes from appealing to men shoppers using techniques and approaches originally refined while marketing to women. She refers to the Wall Street Journal's 12/15/2007 article titled Male Bonding - Women's luxury labels go after men;diamonds at Harry Winston, Lilly Pulitzer ties by Ray A. Smith. Says the article: "The labels say one of their ultimate goals is to get men to shop more like women -- making more impulse purchases and being open to items they didn't intend to buy when they walked into the store. Many men nowadays know what they're looking for when they step into a store and are unlikely to pick up anything extra." Not only are these brands introducing new product lines, but they are "revamping their store designs to appeal to men. Louis Vuitton is creating "masculine spaces" in its new stores that can be seen from the entrance, complete with armchairs, laptops (for customer use) and giant television screens that broadcast financial news..."
And, further, "Men want to enter a store and immediately understand where they belong," says Mr. Beccari. "He doesn't like to look for things. He wants to make a choice rapidly, not take half an hour." What I consider fascinating with all of this is that if you design your store to appeal to a woman - our core constituent especially in categories home-related - you will take her [male] constituents into account, plan for their well-being with chairs and TVs, and generally create a space where both can relax and go about the business of shopping as effectively or efficiently as each prefers. The result? You've also created a comfortable male space. Another suggestion I greatly appreciate is how "Hermès is changing the way it groups men's products in its stores, putting all of the items together rather than separating some by category. So men's watches on display, for instance, would no longer be mixed with women's watches." Creating relevant adjancencies makes sense. It's how I want to shop. And stores that make an effort to understand how I shop, and how I want to be treated are the ones that will earn my loyalty. So, tell me. Do you see how you can improve your business with the Luxury Touch? Carpet can be a luxury. So why not sell it as such? Why not create an experience that surpasses that of Nordstrom or Lexus? Istambul Grand Bazaar originally uploaded by karusel. Do you follow Anthony Bourdain's No Reservations [and the wiki]? It's a fascinating glimpse into foreignness - foreign lands, cultures and foods - from New Jersey to Korea via Brazil and everywhere in between. I love how real and authentic a perspective Tony shares with his viewers - none of it rehearsed. In fact, some of it can be uncomfortably foreign. Yet, he experiences it without letting any personal biases interfere. This is not a genteel cookie-cutter view on travel or food, but rather a celebration of what makes places truly unique, memorable and buzz-worthy. Do you remember when shopping had a sense of adventure and uniqueness to it? When the stores or restaurants you encountered in Decatur, Alabama had nothing to do with what you might encounter in Paramus, New Jersey? When you looked forward to bagels or cheesecake available only in New York City? And barbecue unique to Memphis? And now, where ever you go, you find the same Macy's, Abercrombie & Fitch and Applebee's. In some cases, encountering the same captures comfort. I count on the consistency of my Starbucks venti non-fat latte. It's not the same elsewhere. And the Starbucks vibe, with unexpected tunes, both soothes and energizes. Anthropologie I count on for being consistently different and magical wherever I go. In fact, it's a delight to discover how each store differs from location to location. But, most other places leave me bored and unimpressed. Who needs them unless perhaps for commodity replenishment? They do nothing to help anchor a sense of Place and explain why I have trouble remembering many cities and airports I've been to. So how might we recapture that buzz-worthy uniqueness? Old Istanbul on the fringes of the Grand Bazaar by Rick Steves describes the first mall ever built. Can you imagine? "...It still has virtually tourist-free nooks and crannies that offer an insightful glimpse into the real Istanbul." "In its day, this was the "world trade center" for the entire Ottoman Empire -- locked down and guarded by more than a hundred soldiers every night. The Grand Bazaar remained Turkey's commercial hub through the 1950s, its 4,000 shops bursting with both practical and exotic wares. 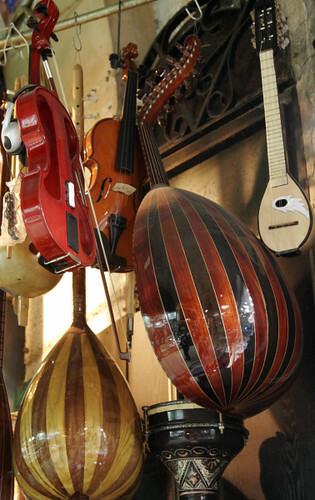 But then the Grand Bazaar was discovered by travelers seeking the ultimate "Oriental market" experience. Prodded by shopaholic tourists with fat wallets, prices and rents skyrocketed, and soon small shopkeepers and manufacturers were shoved to the fringes of the market, crowded out by souvenir and carpet shops." Interestingly, the Bazaar organized itself around like products [something I've also observed in Tokyo]. So you would have the hatmaker's street filled with hatmakers. What seems to make the Bazaar particularly unique and authentic is its mix of shops and workshops located side-by-side, something that may soon be gone forever. Says Steves: "Without both shops and workshops, the Grand Bazaar will eventually become a shopping mall only for tourists." But, that's a challenge we increasingly face as we become over-retailed. Anchors away as malls take a dive. Lifestyle-Focused, Open-Air Shopping Formats Are Replacing Enclosed Retail Centers by Karla Ward addresses the shift from malls to lifestyle centers and places where people want to do more than just shop; they want to spend leisure time. I've touched on lifestyle centers. This example fascinates as it's not about a brand new lifestyle center, but rather a traditional mall trying to reinvent itself. This statement caught my attention: "... malls that lose a department store anchor will replace it with a big box retailer such as Best Buy... mall owners appreciate that model because they are able to charge more rent from the big boxes." That made me think of Istanbul and the transition underway in the Grand Bazaar. Does the reliance on big boxes create too much uniformity and not enough connection to a unique place? Or can big boxes figure out how to customize to meet the needs of unique locations and blend in with specialty stores that offer authentic experiences? One big box retailer that seems to have come up with a solution is Costco. Retail Marketer Of The Year: Costco by Sarah Mahoney from 1/2/2008 describes what makes Costco unusual: "it's a brand that built its reputation by word-of-mouth." The Costco 'mystique' consists of "a kind of 'treasure hunt' atmosphere for shoppers, where consumers can stumble upon anything from chic diamond earrings to a great deal on a laptop to a five-year supply of Cheerios" [or grand pianos and caskets...] all in a no-frills 'industrial warehouse' environment. I can almost picture Costco as the modern day embodiment of Istanbul's Grand Bazaar: great deals, somewhat gritty backdrop, filled with adventure and unexpected finds. Certainly authentic in its focus on delivering to customers [members] an authentic Costco experience. So, how do we bring more of that to our retail landscape? long january originally uploaded by greenhem. January is what drove me off the retail floor. I was okay with the holiday rush, the extended hours and the frantic scramble to keep the floor looking neat and the shoe samples balanced on their displays. In fact, it was fun. Then came January and the letdown was spectacular. I had gotten used to the intense pace, to time zipping by. And, when the pace slowed almost to a standstill, I couldn't handle it. I needed to be more busily engaged. January’s the Time to Get Shoppers Back in the Stores by Mickey Meece from 1/3/2008 caught my attention for that very reason. + "...bigger retailers have fewer unique gifts and more private-label goods." + "consumers ... want to support the companies that make a commitment to their communities.."
+ "...smaller retailers have to be nimble and strategic this month to instill customer loyalty for the rest of the year..."
January, then, has a purpose. For example, "... keep an open line to ... customers" and "engage in grass-roots communications." The article refers to Professor Evans from Hofstra and his list of 15 ways to be smart about marketing in January. 1. Generate store traffic with splashy seasonal merchandise sales while prominently showcasing new products [at full-price]. 2. Promote products/services that support what your customers just received. 3. 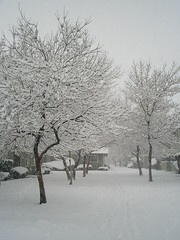 Be hospitable and offer delicious sustenance - coffee, tea, cookies, snacks. 4. "Reward the best employees with an extra day off. Give them a button that says “Star Performer.”"
5. "Empower employees to bend the rules for returns. Consider a distinctive return policy, like 110 percent back on gift items if the customer accepts a store credit rather than a cash or credit card refund. (Limit this to holiday items.)" 6. "Stay open a little longer than regular hours" [especially compared to your competitors]. 7. Thank your regular customers via email or snail mailing and "offer a special gift or discount for their patronage". 9. Absolutely start planning and organizing upcoming events [e.g, something along the lines of Mining March Madness]. 11. Be happy! Look over the past year, makes plans for an even better year ahead. 12. "Keep the store fully stocked. This will help shopper and employee morale. Don’t make it seem as if a distress sale is going on." 13 and 14. Show your support for the community. Become a sponsor; donate excess products. It promotes your name and reputation. 15. Be sure to Advertise. Our Wear-Dated Regional Managers just this week reiterated that those carpet/flooring stores advertising consistently are the ones benefiting from the business that's out there and remaining profitable! Maya Avrasin offers Perspective in the 12/3/2007 issue of FCW in "Lack of traffic fuels problems." The article quotes Jon Logue, co-CEO of Alliance Flooring: "... When business was good, retailers could push back plans to renovate their showrooms or update racks, but not anymore," Logue said. "Now it's time to take sage advice and use it... It's cutting costs, optimizing their business, diversification and making sure their showrooms are up to date." 1. "Women want to be treated as if they matter. Ask our opinion and then listen to our answers." 3. "Make it easy for us to contact you." 4. "Keep your navigation simple." In other words, make sure your store is neat, well-organized, welcoming and clean! 7. "Continue to offer loyalty programs... Reward women for their loyalty." 8. "Concentrate on your own hometown first." 9. "More women than men check out a site's About Us page." So, include something about your heritage, who you are, why someone should buy from you. Read them all for yourself. Each one matters. So there you have it. Tips for dealing with January at retail. Do you have any you'd care to ad? How Might Flooring Displays Tell Better Stories? 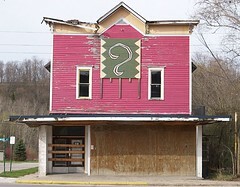 Question Mark Sign On Hobson's Old Building, Corner Of Henry & Main (Honor, MI) originally uploaded by takomabibelot. Two recent posts - What Luxury Marketing Can Teach Us and In Search Of An Experience - have propeled the thought process forward. In fact, I have a challenge in mind. Will you take part? This from my July Blogtippings post: Imagine transforming a lousy experience - in flooring, for example - into a positive simply by figuring out How to be Different - as Ryan Karpeles describes. Or, consider truly looking at the world from your customer's perspective as Becky Carrol illustrates via Customer Lenses... to better appreciate where our customers are coming from and going to - literally and figuratively - to then craft a better marketing experience with them. I believe that consumers are truly In Search Of An Experience for every category out there. Look at the transformations that surround us.... Apple vs. electronics. Starbucks vs. the corner coffee shop. Barnes & Noble vs. musty/dusty bookstores. Flooring - in my mind - represents untold opportunity for reinvention. Melodies In Marketing's Mario Vellandi comments that "experience design is what it all comes down to nowadays.... Diverse affordable merchandise is available practically everywhere. What's the differentiator if people could get cheaper goods at any discounter? An emotional experience across multiple interaction points is what builds loyalty, and makes the shopping trip memorable and WOM-worthy." Peter Kim has had recent flooring experiences, and they've been lousy. He says: "I'm building a house and there wasn't much of a flooring experience of which to speak. I imagine part of this comes from the fact that the particular store I'm working with must have a heavy commercial business, so focusing on the individual consumer isn't a priority. However, I probably would've bought much more expensive tile and carpet if it had just been presented differently, rather than assorted manufacturer POP displays stuck into free space around the store. Unfortunately for flooring, my understanding is that it typically happens last in the decision-making process when most people have already spent a ton of money. In any case, using personas and tailoring an experience for your most important customers would still go a long way... "
Pete highlights a critical point that works against flooring: decisions tend to be made late in the design process, and thus get short shrift. Subject for another discussion. Using personas and tailoring the experience - as Becky also suggests, would definitely help. But what about product presentation? How might that be improved? If you remember from What Luxury Marketing Can Teach Us, Chris Ramey made specific suggestions for product presentation: sorting by color, editing out anything that isn't consistent with store message and positioning, even eliminating wing racks... Not doing so leads to missed opportunities to trade customers up on their product choices - as Pete describes. How might displays do a better job telling the product story? Flooring can absolutely transform the vibe of our homes - our most precious and individualized investment - by adding luxurious texture and cushiony warmth with tantalizing color underfoot, or creating a polished, glistening opulent formal entertaining floor surface, or a practical, hearty, Tuscan-like kitchen backdrop. Given the rich potential of the category, how might it be better displayed? Mario Vellandi offers an interesting analysis of Merchandising Innovation: Soup. If soup can be improved, can't carpet? My dream flooring store would include all of the elements relevant to the creation of a perfect home interior... paint, wallpaper, lighting fixtures, ... It probably wouldn't be called a flooring store since it's more about creating that perfect home space. Perhaps it's a concept store [think of all of the marvelous vignettes that IKEA creates in-store, or the wealth of ideas that a Pottery Barn catalog offers]. Within, I'd want to linger, take my time, relax and reflect and a coffee bar would really help nurture the right vibe. Music, too. It should definitely represent an opportunity for feasting the senses. Organization by color seems like a no-brainer. That's how I shop for carpet. So, tell me. How would you display flooring products? How best to let them tell their story? How to showcase product so it sings to us as we select the most beautiful product possible to enhance our home living environment? Naturally, I'd like to hear from as many of you as care to participate in this fundamental retail challenge. I particularly welcome additional thoughts from Mario Vellandi, Peter Kim, Becky Carroll, David Armano, Ryan Karpeles, Shannon Bilby and David Polinchock. 1. Share your vision and perspective on how to display carpet so it enchants consumers. 2. Refer back to this post. 3. Encourage others with a passion for design, user experience, or a firm desire to banish sad consumer experiences to participate. I will recap all of the responses in a separate post. I also expect to share your thoughts at every opportunity with the flooring industry - in presentations, articles and blogposts at Talk Floor Blogs. 90 days to go until Blogger Social '08. See this beautiful collage? Mark Goren and Luc Debaisieux created it. There you see it: the unbelievably talented marketers definitely attending. This is one terrific crowd and I'll be meeting each one in person! Having met several of them already, I can guarantee that this will be a social event unlike any other. Imagine learning more about and from Susan Bird, Tim Brunelle, Katie Chatfield, Terry Dagrosa, Matt Dickman, Luc Debaisieux, Gianandrea Facchini, Mark Goren, Gavin Heaton, Sean Howard, CK, Valeria Maltoni, Drew McLellan, Doug Meacham, Marilyn Pratt, Steve Roesler, Greg Verdino, CB Whittemore, Steve Woodruff, Paul McEnany, Ann Handley, David Reich, Tangerine Toad, Kristin Gorski, Mack Collier, David Armano, Ryan Barrett, Lori Magno, Tim McHale, Gene DeWitt, Mario Vellandi, Arun Rajagopal, Darryl Ohrt, Joseph Jaffe, Rohit Bhargava, Anna Farmery, Marianne Richmond, Thomas Clifford, Lewis Green, Geoff Livingston, Kris Hoet, Connie Reece, CeCe Lee, Jonathan Trenn, Toby Bloomberg, and Seni Thomas.... I can hardly contain myself! Several will certainly be experiencing untold hardship getting to Manhattan... severe traffic from New Jersey, bridge or tunnel delays, long waits for Long Island Rail Road trains, complicated subway routes from uptown. Serious stuff. Others have it easier, with leisurely jaunts across the Atlantic from convenient places like Oman, Belgium or the U.K.
Then there's the Central Iowa Bloganostra crowd. I'm counting on them. They'll probably bring Panera goodies with them. I heard MasiGuy might even ride his bike all the way from California. And a few - Katie Chatfield, Gavin Heaton - are using this as an excuse to go on walkabout all the way from Down Under. In any case, it's The event of The season. So, you might not want to miss it. 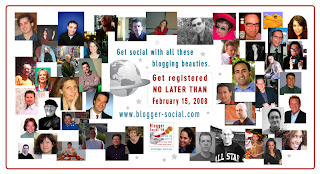 You have until February 15th, 2006 to register for the Blogger Social '08. If you're not sure, then check out the details. And, if you're still not sure, then be sure to watch Mark Goren's amazing video [I intend to learn from him how he created it during the social!]. Feedreaders and subscribers, please click on the YouTube link to see Mark's video [it includes some of my NYC photos!]. If you are already on board, and you've missed the news so far, then please grab the collage and the video and spread the word on your blog. My article on 'In search of an experience' from the 11/12/2007 issue of FCW. a. An event or a series of events participated in or lived through. b. The totality of such events in the past of an individual or group. There's so much talk about experience, but what does it really mean? We yearn for experiences. Our consumers are no different. Increasingly, it’s what we routinely encounter shopping for groceries at Whole Foods Market, ordering java at Starbucks, celebrating a birthday party at American Girl Place or banking at WaMu. According to Pine and Gilmore, authors of The Experience Economy: Work Is Theater & Every Business a Stage , experience is the sum total of every interaction a consumer has with your store before, during and after the transaction, the sum total of an individual’s perception [i.e., how that customer feels about you] of your organization. It's based on all the direct and indirect interactions she has with you. Turn that around and experience becomes our opportunity to affect a customer’s perception and feeling by altering or gently manipulating every aspect of an encounter with us [virtual or real] to establish a positive relationship. Talk about effective. No matter where in that customer’s life cycle she is, her interactions with you must be memorable, delightful, inspiring and repeatable. Buying goods or services from you goes beyond physical ownership to a realm where emotions reign supreme, creating something priceless and completely disassociated from commodity. That means that your store can’t just offer any old ho-hum experience. Your store has to literally jump off the sidewalk and capture customers’ imaginations and curiosity, drawing them into your store. They emerge wanting to return again and again. They tell everyone they know about the experience you offer. They participate in a long term relationship filled with a multitude of transactions and interactions, possibly even joining a community of impassioned believers in your unique experience. Think Harley-Davidson or Apple. As consumers, we are time-starved. We multi-task, over-schedule ourselves, and stress-out. We yearn for simplifying solutions and delightful experiences as we become intolerant of borderline service, inadequate products and uninspired retail environments. With so many options online and off, we call the shots. Our most critical consumer decision-makers – women, making or influencing more than 85 percent of the purchase decisions – want value, quality and substance, with flair. They look for it in engaging, respectful, and fashionable retail environments. If they don’t find it, they walk away and share that disappointment with others. Furthermore, for the first time ever, we live in a society where the majority of the population is over forty. People over 40 have basic needs taken care of. With more disposable income than when they were younger, they’ve accumulated quite a lot of stuff, which means they become pickier about how to spend hard-earned income. They won’t waste it on a lousy experience. Instead, they want to learn from the interaction; it should be the basis for something unexpected, unusual, uplifting and generally positive that engages emotions and senses. Pine and Gilmore explain that our economy has progressed beyond raw materials, beyond goods, and beyond service to become experience-based. Competing on price being no longer an option, the only way to differentiate ourselves is through the experience we offer. Aren’t you living Pine & Gilmore’s "The Experience Economy?" I am. I resent stepping foot into an uninspired retail store. I loathe dirty, sloppy and cluttered environments. Surly attitudes make me run in the other direction. I expect perfect product options at a fair price, and I demand convenience. My expectations are high, and, if I can’t find what I need in your store, I know exactly where to go instead - the Internet - or, I’ll simply pass. Our basic survival needs have been dispatched. We no longer make cakes from scratch; forget cake mixes, and bakeries are somewhat passé. I may choose [or I may not] to offer my child a full birthday ‘experience.’ It will be memorable, unique and totally focused on her. So what if it costs $300 rather than $1. After all, my little girl will only be little once. Unfortunately, our flooring store experience hasn’t kept up. Ours is about a raw material or goods economy experience, focused on the lowest price available. We tout features and benefits when she searches for the means to creating a beautiful and fashionable home. How might we offer an ‘experience’ instead? Well, we need to go beyond price, beyond goods as commodity, and beyond service to the totality of her interactions with our store. She’s searching for that experience; let’s create it for her. Hat tip to Jim Aaron from CCA Global University for the inspiration.